Aiken's latest Austen-inspired work (Emma Watson, 1996, etc.) 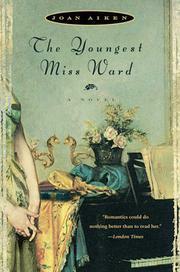 takes up the fate of the youngest Ward daughter from Mansfield Park. Young Hattie Ward is virtually besieged with vipers--by her uncaring father, her shrewish sister Agnes, and by the uncompromising Lady Ursula, who has taken up temporary residence in Bythorn Lodge. As punishment for accidentally breaking her sister's prized toiletries (while falling down the stairs), Hattie is sent to her uncle's home, where she receives slightly better treatment and where the Austen-like plot begins, peopled with both rascally and saintly types who throw Hattie's life into a genteel spin. The years pass tolerably at Uncle Philip and Aunt Polly's, with three boy cousins as company and the private mission of rehabilitating the twin girls (deemed mentally defective and kept isolated in the nursery). Hatty makes the acquaintance there of Lord Camber, a utopian idealist who takes an earnest interest in her poetry. Unfortunately, her Lord is sent off to America as an indentured servant (despite the dukedom he's to inherit) to build a "new community." Through a series of ill-fated circumstances, Hattie is sent packing again, this time as governess to Lady Drusilla (a musical savant, but unable to learn anything else) and the nasty Lady Barbara. She continues with her poetry and pines quietly for Lord Camber. Meanwhile, the specter of Lady Ursula haunts Hattie--for she's become her stepmother, and now her widowed stepmother, who's looking for a place to live, finding none, and getting a comeuppance for her years of sourness. When Hattie finally quits her position (klepto Lady Barbara's stolen some of Hattie's poems), she retreats to Lord Camber's cottage to await his return . . . . Fun yet slight fodder for Mansfield Park fans.